The Board of Directors is the policy-making body of the Greater Easley Chamber of Commerce and its members represent the business and professional leadership of the community. In addition to serving as the governing body of our organization, Board members offer guidance and leadership for program development and community outreach related to public relations, tourism, membership, economic development and public policy. Thanks to these individuals who have made a commitment to serve on our governing board. 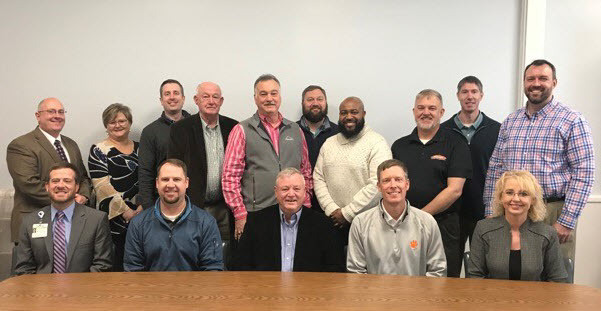 Pictured (seating L-R): Todd Walker, Sid Collins, Jerry Garrett, Lawson Clary, Joy Bryant (standing L-R): Brian Swords, Stephanie Lackey, Trent Acker, John Cutchin, Tim Mays, Stephen Steese, Artis Bufford, Jeff Kittle, Robert Halfacre, Johnny Harvin. John Cutchin, Palmetto Plating, Inc.